Whether you’re a local member of the Longyearbyen community or you’re a visitor in the dark north, there’s so much to eat and experience at Polar Permaculture. Reserve your appointment to explore the farm, see the dome, learn about permaculture practices, eat a locally-grown meal, and even try your hand at sustainable arctic agriculture! We offer a variety of tour choices for locals, tourists, foodies, and fellow innovators that range from a friendly 30-minute introduction to an all-day immersive experience. Basil, lettuce, sprouts, and a variety of microgreens are available for sale at local grocery stores and served daily at Svalbard restaurants. You can also purchase a taste of the Arctic online in our virtual store, sign up for local cooking classes, and take advantage of our personal chef service. We’ll shop, cook, and clean for you in your own home with fresh, local ingredients that come straight from the farm. Visit our market and workshop at Handicraft center next to the Galleri Svalbard to purchase handmade items and heritage souvenirs, including artisanal fish skin leather. Every purchase supports reliable, nutritious food access for the Longyearbyen community. As part of our commitment to a sustainable, circular cycle, we take back delivery trays with organic and biological waste for composting. The farm houses more than 10,000 red worms that create effective, organic natural fertilizer for our soil while also diminishing the harmful effects of dumping waste into the ocean. Learn about your options for home farming and purchase our soil here. Here is a portfolio of projects we have work on all over the world. We are working with the fourth and ninth grades to teach them the following: Composting with worms, growing food, and how to be more sustainable in the "northern most" town in the world. All solid waste in Longyearbyen is shipped back to the mainland, but all organic waste is dumped into the sea. Hopefully with the youth learning how to compost and grow their own food, we will be able to reduce the amount of organic waste we are dumping into the sea in the coming years. We explained and demonstrated worm composting with both classes, and set up systems in each classroom. We had the students plant seeds, and start to grow them under LED lights. We waited two weeks, and then tranplanted everything that has grown into pots. The students sifted our their worm castings, and incorporated that into the growing media as well. Students grew there own food,and we had a celebration dinner using all of the items we grew. The whole point of this was to connect the students back to the gardnen, and teach them how nature has been doing things for millions of years. Northern lights over the "northern most" dome greenhouse. What started as a humble attempt for chef Benjamin L. Vidmar to produce the freshest food on the island has turned into an attempt to make Longyearbyen, Svalbard one of the most sustainble towns in the world. Benjamin was head chef at Svalbar Pub, and dissappointed with the quaility of produce that was sent to the island. He decided to grow his own, and started working with hydroponics in the lab downstairs of Coal Miner's Cabins hotel. Benjamin was able to grow edible flowers, lettuce, tomatoes, and many other items, but decided to change his strategy after he learned that all organic waste was dumped into the sea untreated. Benjamin thought about creating a circular economy where biological waste was captured and then processed into biogas and compost. These waste streams would be converted to heat, electricity, and fertilizer that could be used to grow more food. 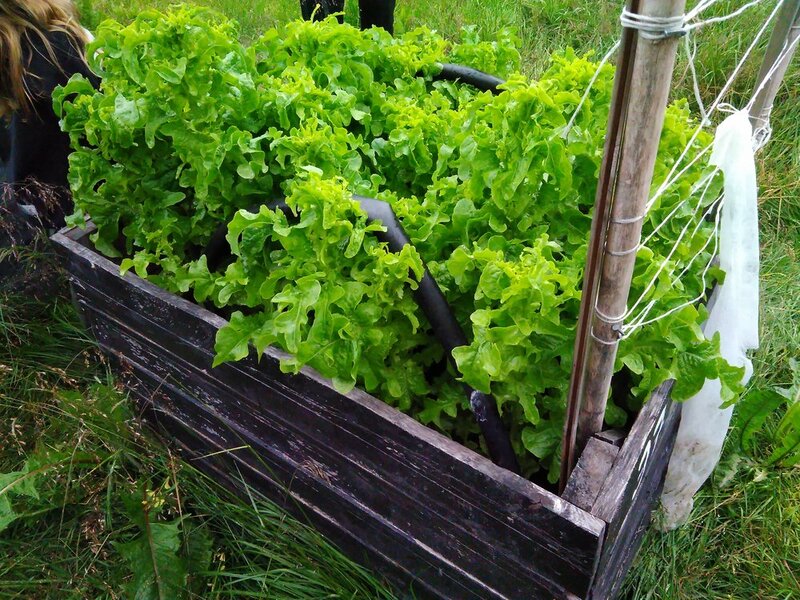 Presently Polar Permaculture is growing microgreens, raising quails for eggs, lettuce, herbs such as basil and coriander, sprouts, and soon will begin producing biogas from all organic waste. Partnership initiatives” Coordinator in the project “The temple of the ancestral heritage - Preservation, restoration and exhibition of "St. Nativity ofthe Virgin "- Milanovo village, Svoge municipality. 1. Participation in the first partner meeting in Sofia, Vratsa and Milanovo – 21-24 august 2015. During the visit we presented the main activities of our organization and expertise to the partners, media and local authorities. We visited the office of the partner organization Vrachasnki Balkan Nature park Administration and the church St. Nativity of the Virgin " in Milanovo village (before the restoration). We made pictures and after our visit we published information for the project and its aims on the internet site of Polar permaculture. We shared information also by official facebook page of the organization. 2. Preparation and participation in Festival “Traditions and ancestral memory” - 12-15 October 2016 in Milanovo village. During the preparation period, we made research for potential participants in festival and prepared the presentation program of the Norway culture. During the festival we presented traditional costumes, customs and food, typical for Norway. Four participants from Norway took part in the “Traditions and ancestral memory”. During the festival we made videos and pictures, which we shared in the facebook page of the organization. 3. Disseminationed all of the results. All English materials (brochure for the project and brochure for the church "St. Nativity ofthe Virgin ") have been disseminated to the local community and tourists in Spitsbergen, through the hotels, tourist points, public events. Information for the festival “Traditions and ancestral memory” – videos and pictures have been published in the internet site of the organization and in the facebook page. 4. Management and coordination of the project – we have prepare in the reporting documents, timesheets in time. During the project duration we kept close contact with the project manager concerning the smooth running of the project activities. We are very happy about having Benjamin Vidmar participating in the in Chef in Residence program in Træna from 14.02.2018- 20.02.2018. As the core activity in the residency Benjamin became part of the annual Winter festival Træna Taken by Storm (Ta Træna med Storm) and was the head chef for the Friday program. He collaborated with local chefs, volunteers and food entrepreneurs, among them a seaweed specialist, and served a 5-course menu for 65 guests during the seminar session in the festival. It was an experimental tasting menu with local seaweed and seafood in every dish. He also prepared a festival dinner for 120 people in the outdoor arena called Hjellan. The food was prepared from local products, and was a combination of fish, seafood, vegetables, seaweed and whale. Both activities were very appreciated by the guests, and the positive feedback was massive. During the seminar, Benjamin was invited to hold a presentation and a dialogue on stage. A short documentary was also shown. The audience was very enthusiastic about his contribution. During the residency he also cooked for locals, participated in an island hopping, had dialogues with local chefs and inspired the island community and its visitors on how to create a more sustainable food chain. NRK, the Norwegian Television made reports from the food events, highlighted as one of the most creative and experimenting happenings during the festival. Benjamin has fantastic qualities - as chef, speaker, food entrepreneur and sustainability engager. He is flexible, enthusiastic, warm-hearted, committed and have social skills complementing his dynamic and ambitious way of working. We warmly recommend him for any kind of assignments! The Permaculture Collaborative Laboratory (CoLab) is a space to collaborate, a space to enhance the effectiveness of permaculture networks. If you share our vision of a healthy world in which we care for the earth, each other and future generations, in harmony with nature, then this is a space for you to get collaborative work done. If you are working on projects and enterprises that work towards that vision then the CoLab is where you will find support. Benjamin L. Vidmar is working as one of the stewards on this project, and is help to shape the future of permaculture, and also the world. The CoLab meets up once per month, and go over many different ideas and issues. For more information, please see below. From 23.07.2018 until 02.08.2018, I am here to take local ingredients, and make new recipes from them. For more information, check here, or here.